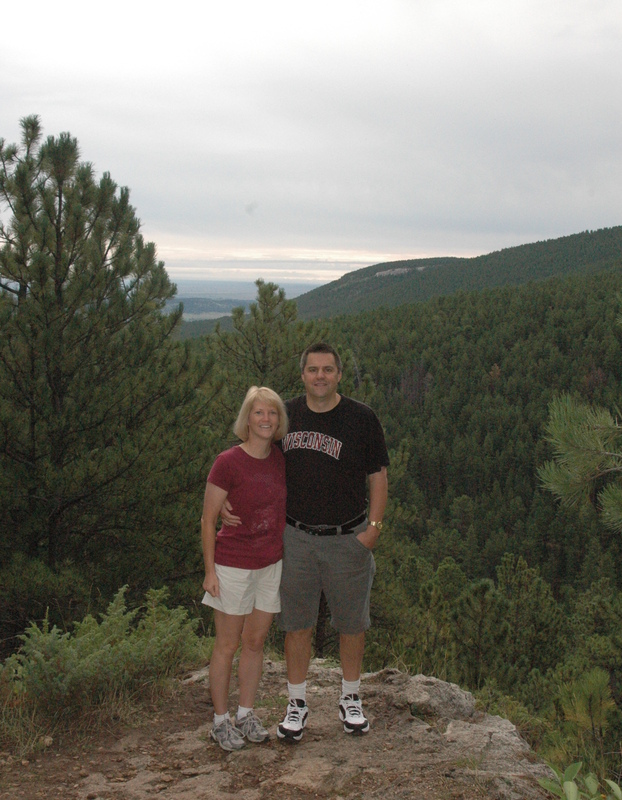 We packed up and left Custer, SD the morning of September 10 and made it back to Dan’s sister’s house around 1:30am. Originally, we did not plan on driving all day, but the weather was perfect, traffic was light, and Dan felt good, so we just kept on going, and going, and going! We would have made better time, but encountered a bridge that was out, and had to drive 17 miles south to get across on the next bridge, along with 17 miles north to get back to where we were. Then Bambi and her friends kept darting across the roads, so we going pretty slow for the last 2 hours. We woke up the next morning to multiple text messages and photos from our fellow Crazy Horse co-workers of the big snowstorm that started the night we left!! We were very thankful to get out before the snow. 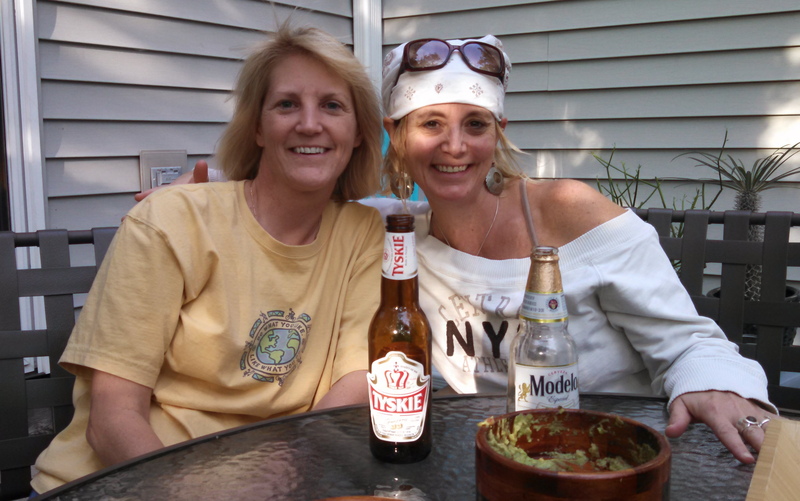 Before we left, we did manage a final outing with Phil and Rudee. Dan went golfing with Phil, and Rudee and I checked out Bear Country again, to see how much the little bear cubs have grown. They have tripled in size, in just 2 months since we were last there. 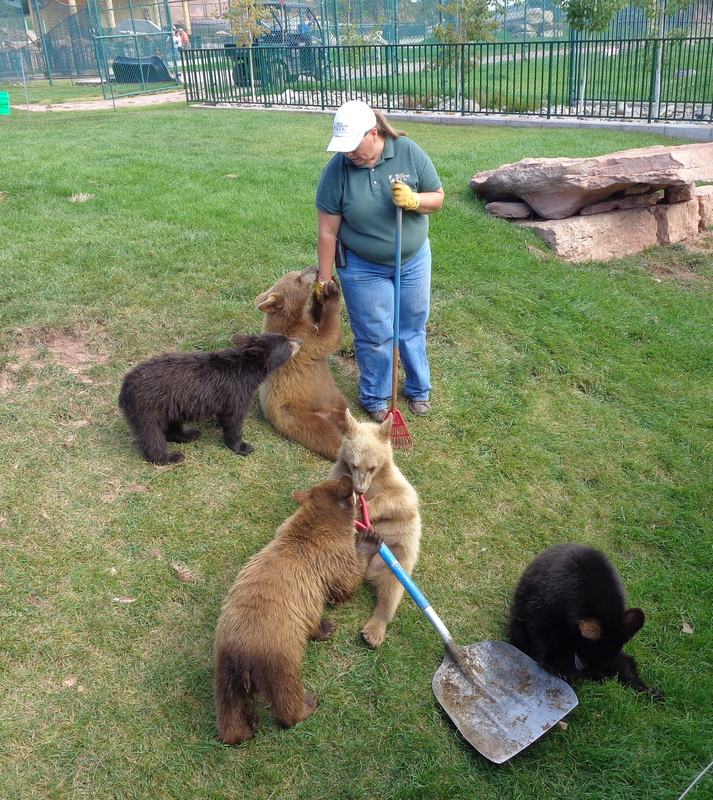 One of the employees was trying to scoop up poop, but the cubs were more interested in getting the rake and shovel from her. She spent some time talking with the crowd that was watching, Wouldn’t this be a fun workcamping job? It was mating season for the Elks. 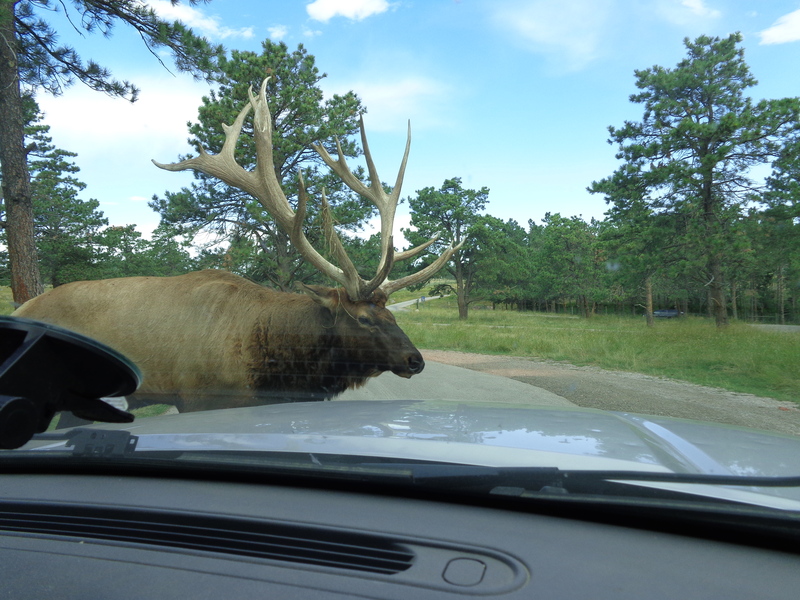 Upon seeing this beautiful Elk, Rudee rolled down her window and whistled at him…. Apparently that was a “mating call” whistle, because he came charging down the hill and checked us out! 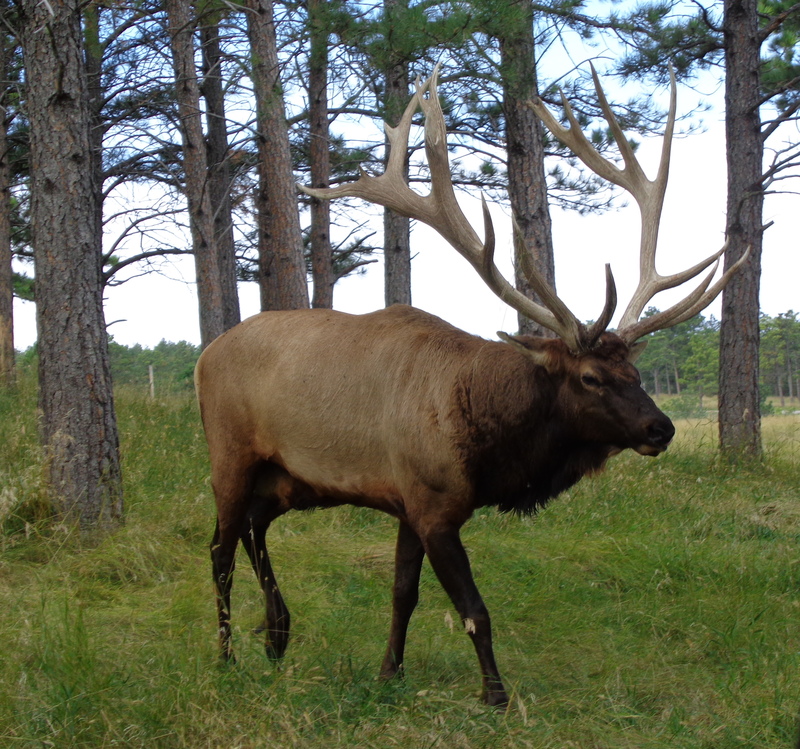 So if you ever go Elk hunting, Rudee knows how to get their attention. The last several weeks have been busy getting together with family and friends, although we were unable to see everyone that we wanted. We simply ran out of time, and could have used a few more weeks. 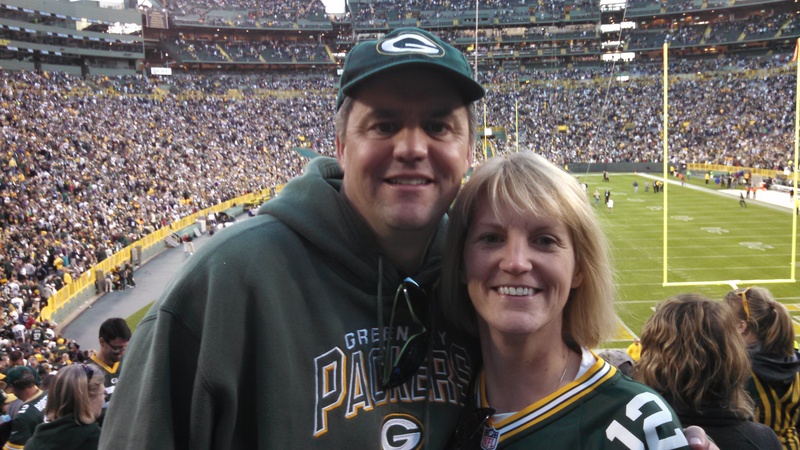 We have not finalized any plans after mid-April, so we may be back to Wisconsin for a week or two at that time. We are still looking into our options for working next summer. 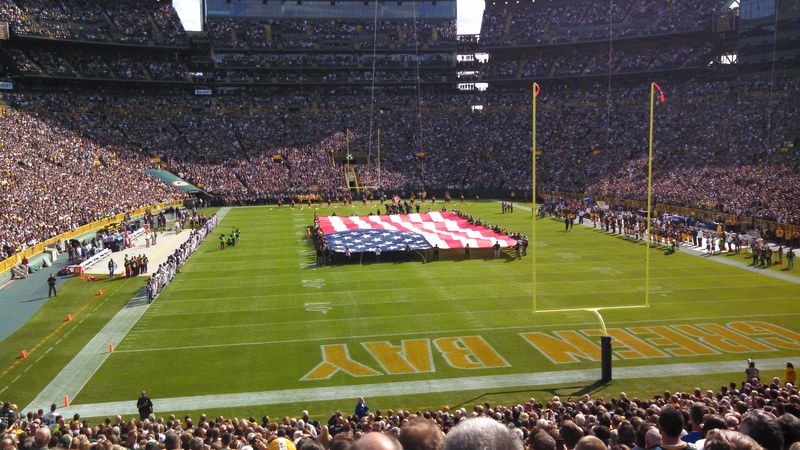 We did make it to the Packers home opener, against the Jets. This will be the only game we can attend this year, and still have our tickets available for the New England and Atlanta Falcons games. If you’re interested, let us know. 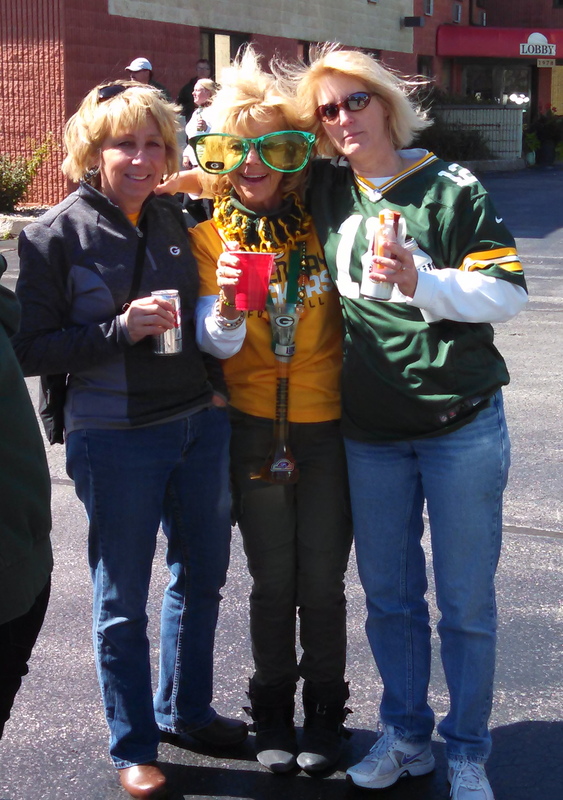 We met up with some friends before the game for tailgating. 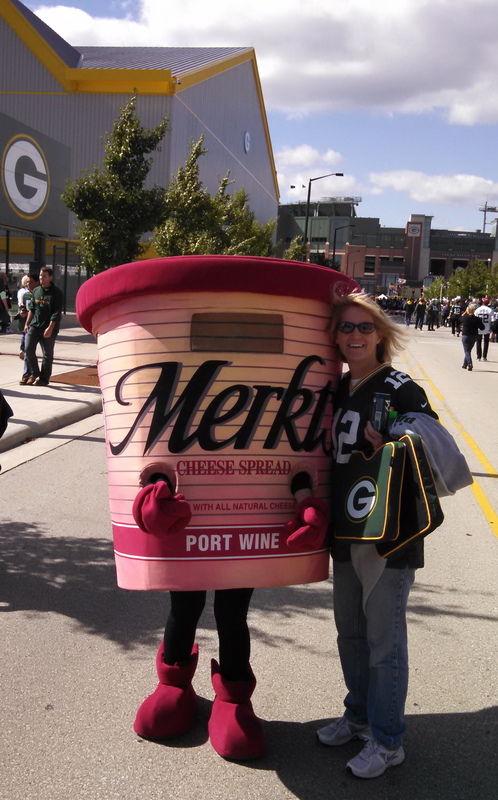 Only in Green Bay would you run into characters dressed as cheese spreads! It was fun getting together with those that we did see (and we forgot to take photos of all the get-togethers). We also took full advantage of having fast, unlimited Wi-Fi at Dan’s parents, to get all the updates on our computers and iPad done. After that, we decided to “unplug” and get away from our devices. Which is why I haven’t posted a blog in a while. Now it’s off to Campbellsville, KY for our 2nd year working at Amazon. We requested the same shift and department as last year. We will have our orientation day on Tuesday 9/30, so we will find out for sure what we will be doing. And I still need to finish up a few more South Dakota blogs! With just 3 more days left at Crazy Horse, we have been busy packing up our stuff, checking the roof for debris, putting Makena’s kennel back in the truck (she was very excited to see this) and inflating the tires. Saturday (9/6) we had a huge crowd at work for the night blast to commemorate the anniversary of the death of Crazy Horse and the birth of Korczak, the sculpture of Crazy Horse Memorial. 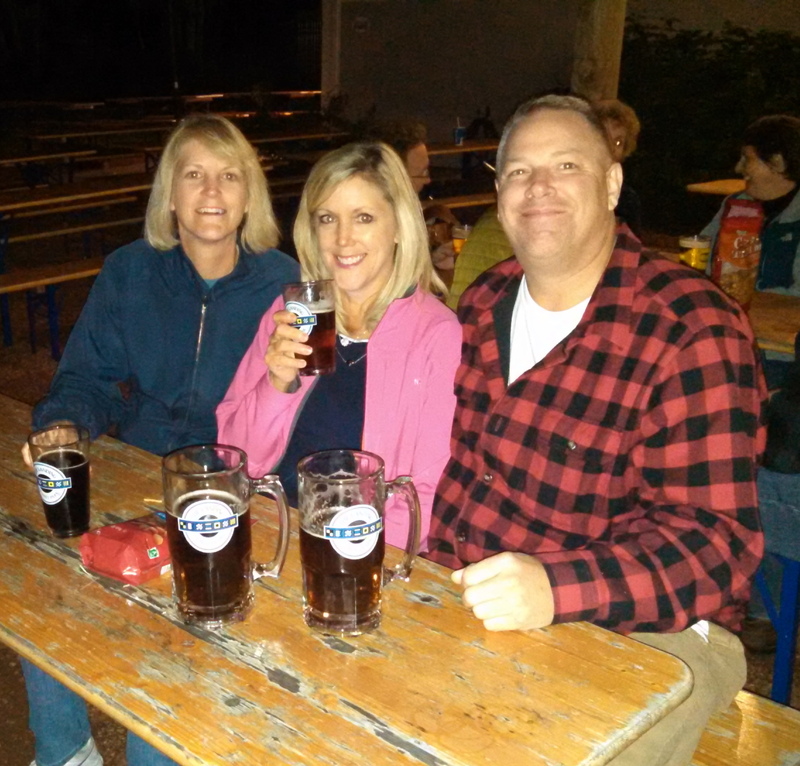 “campground” (Dan’s sister and brother-in-law, Linda and Doug). We will be parked there for 2 weeks, and then head down to Campbellsville, Kentucky, for another season at Amazon. We have a start date of September 30. We will not be online for a few days, as we will be returning the Wilson 3G cellular booster that Phil and Rudee have so graciously allowed us to use this summer. Without it, we would not have had any cellular telephone service or internet at all. We will be looking into purchasing a booster, but have been waiting as the 4G boosters are just coming on to the market. I still have several more blog posts to do, and will try to get all caught up with South Dakota stuff before we leave for Kentucky. 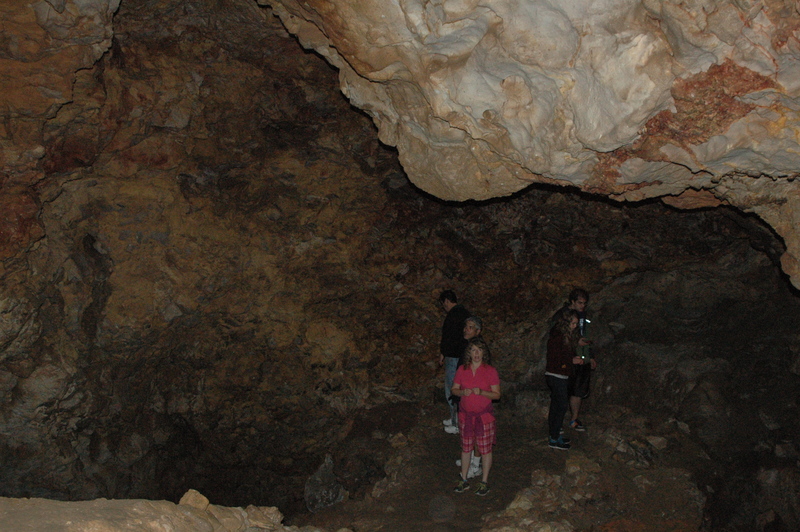 The Black Hills area offers six different cave sites for your spelunking pleasure. We were fortunate to have enough time to visit all six. If you have limited time, we would recommend Wind Cave and Jewel Cave, both operated by the National Park Service. We have previously blogged on those caves. Now we will catch up on the other four. Of the four privately owned caves, we enjoyed Wonderland Cave the most. 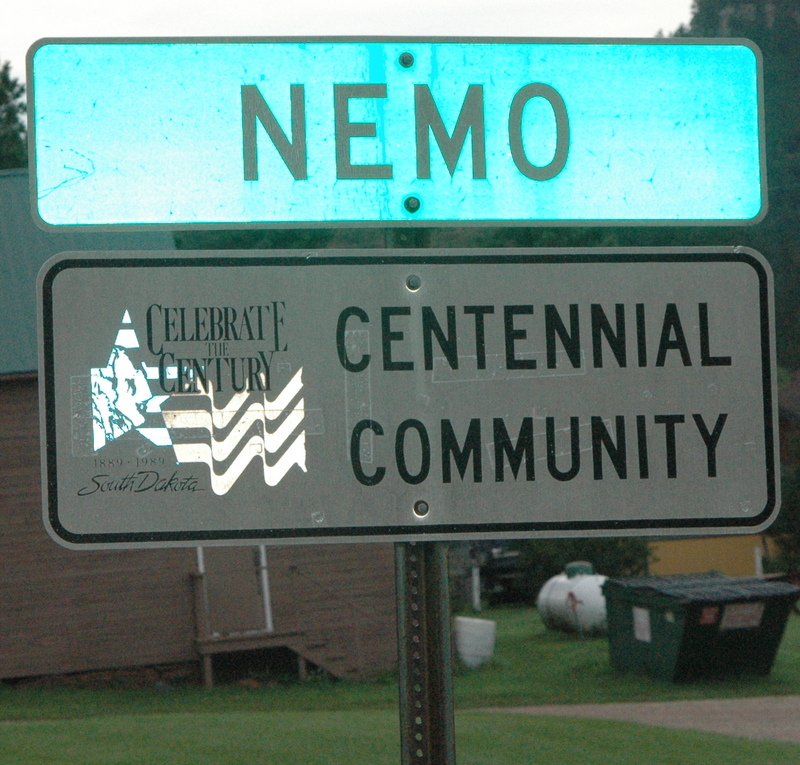 The cave is located near Nemo. The cave was discovered in 1929 when two brothers were searching for their lost dog. They could hear the dog barking, and followed the sound into a hole and discovered the cave. The cave is on land owned by the U.S. Forest Service, and in the 1930’s, the Civilian Conservation Corps worked on exploring and mapping the cave, along with constructing the steps and paths in the cave. It is surrounded by beautiful scenery. The cave has only had two owners, which run the cave tours through a special use permit from the USFS. As such, the cave is fairly well-preserved. 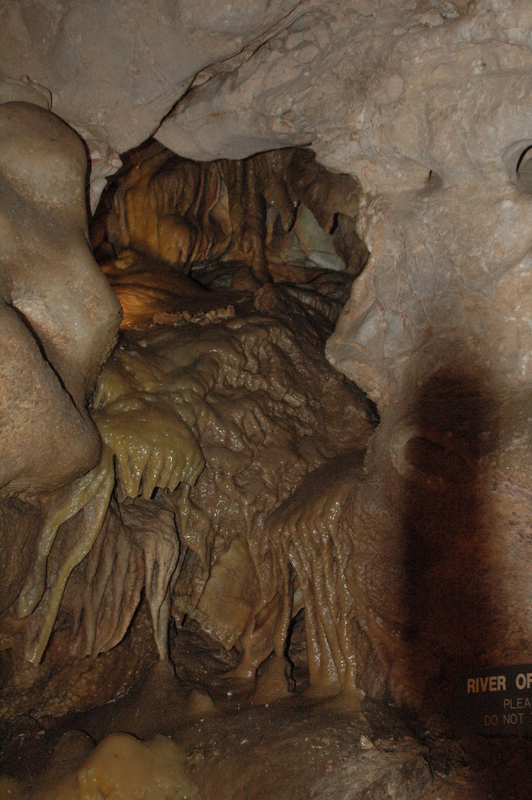 This cave is a “wet” cave, and has the only living Helictites formation in the area. We have never seen this type of formation before. 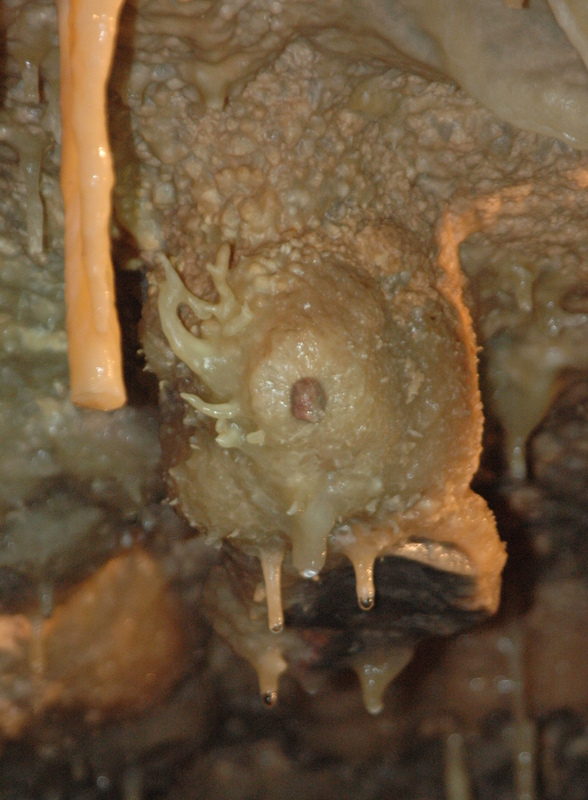 Helictites are found in limestone caves and are believed to have a capillary system. 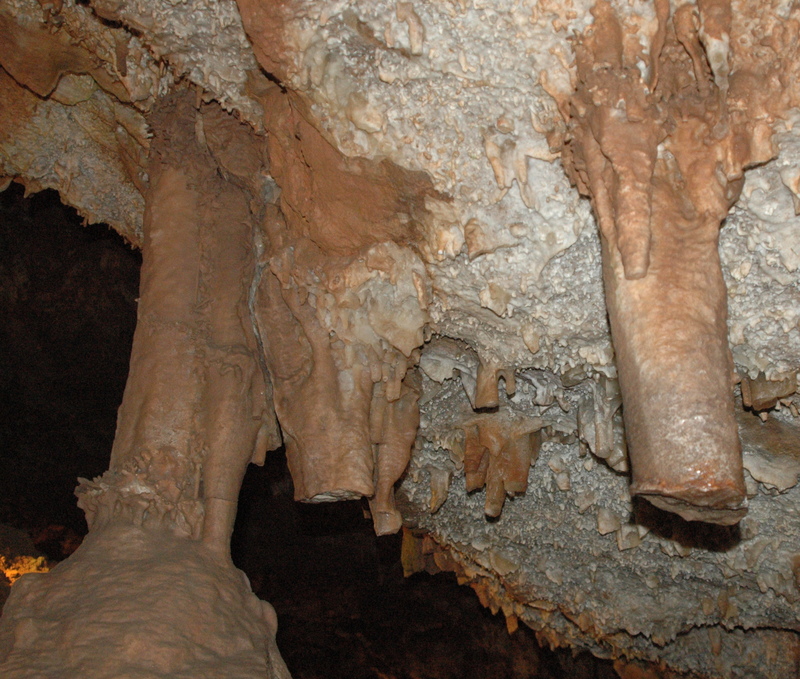 The formation starts out as a stalactite, but over time the growth may twist and turn, defying gravity. The one we saw was growing out and up. Our tour guide stated the dark spot was “the spine”. 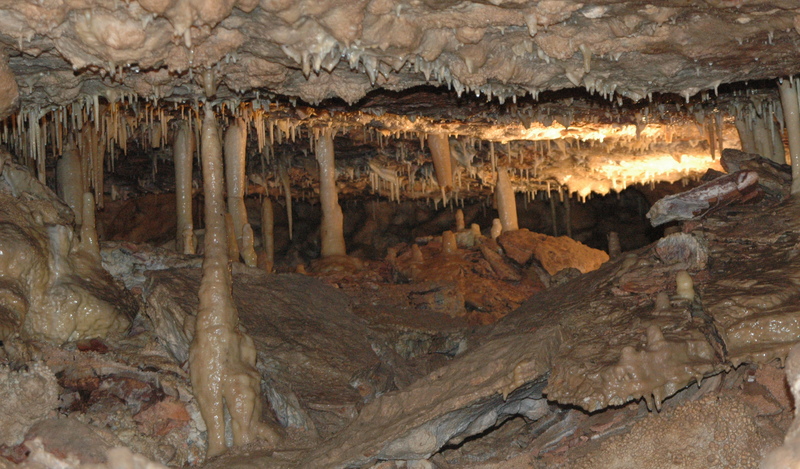 The cave also has examples of Boxwork, dog tooth spar crystals, flowstone, and many stalagmites and stalactites, along with the columns that occur when they reach each other. 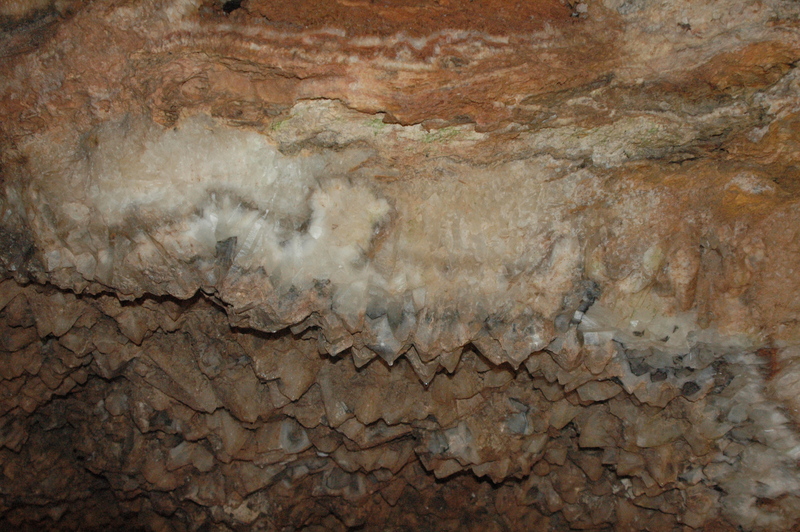 We also saw an example of frost work, which can be seen in some of the other park service caves, but not on the basic tours. They do not have a light on it, to keep it preserved, but our tour guide did point it out with a flashlight. We did this tour at the end of August, as we were more “ho-hum” after seeing the other privately owned caves. This cave is certainly worth a visit (cost $14.50, and yes Madge, it was free with VIP pass). Our tour was about 90 minutes, but we are not sure if this is a typical length of time. There was a newspaper reporter with us, and the manager was giving the tour, so we felt we lucked into getting a more detailed tour. And it was just the four of us, which made for an even better experience. The brochure for the Black Hills Caverns, discovered in 1882 by gold miners, and established as a tourist attraction in 1939, advertises itself as having the most complete formations of any cave in the Black Hills. However, we did not see any frost crystals or helictites on our tour (but they do have samples on display in their gift shop area). Black Hills Caverns ($12.50 for adults, free with VIP pass) has very large rooms, a lot of flowstone, narrow passages and lots of stairs to go up and down. The tour lasts 60 minutes. Rushmore Cave was discovered in 1876 when the Black Hills Mining Company was working nearby, and built a flume for their water on the hillside, for their mining operations. The flume leaked, but the water did not run down the hill, but disappeared into it. The miners went in search of the water, and discovered the entrance to the cave. It opened to the public in 1927, and was named Rushmore Cave during the time Mount Rushmore was under construction. In the 1950’s, under new ownership, tours were given 24 hours a day. The wear and tear from all the public visits is evident in this cave, as it has so many broken stalactites. The cave has a lot of stairs to go up and down, amongst the smooth limestone walls. The cave has now been turned into a bigger amusement type attraction, with the addition of the Soaring Eagle Zipline Ride and the Gunslinger 7-D interactive theater. 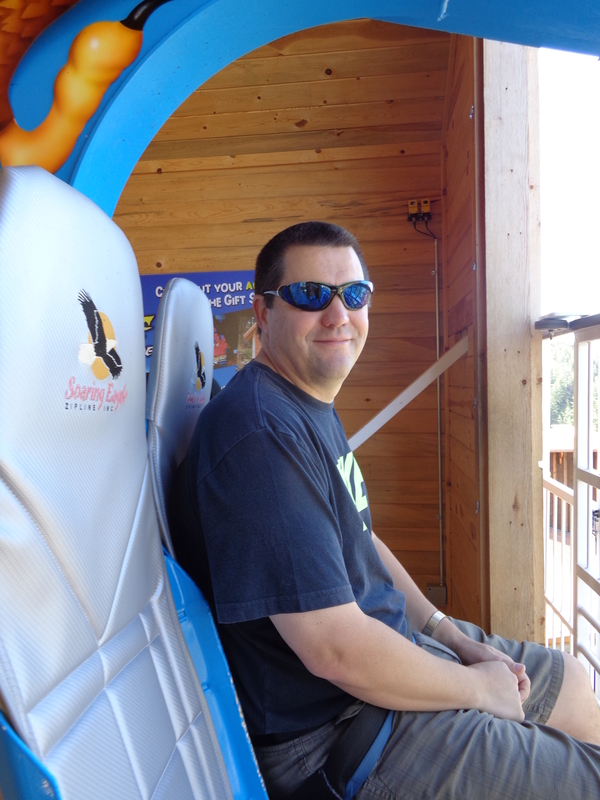 The zipline is more of a chairlift that goes down the hill and back up again. The ride lasts 90 seconds. The gunslinger attraction is more like something you would find at Disneyworld, as you sit in a chair with 3D glasses and shoot at the animation on the screen. We had fun doing this, but mainly it was because we were the only 2 people in the theater at the time (we did this in Mid-May, before the tourists arrived). The cost for all three activities (cave tour, zipline and Gunslinger Theater is $28.00, free with VIP pass). The cave tour itself is $12.00. The cave tour is the best of the three attractions. Sitting Bull Crystal Caverns was the most disappointing of all the caves we have visited, as well as the most physically challenging of the cave tours. We would not recommend this tour. The cave was discovered in 1929 by a couple exploring the above ground cave on their property. It is believed that Sitting Bull camped in the above ground cave. Nearby is the entrance to the below ground cave. 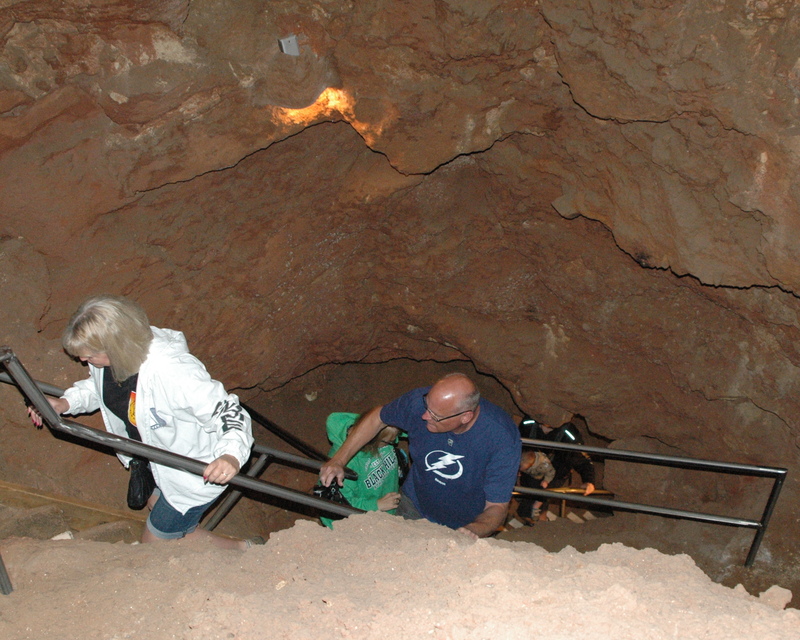 It is a very challenging, very steep descent to get down into the cave. 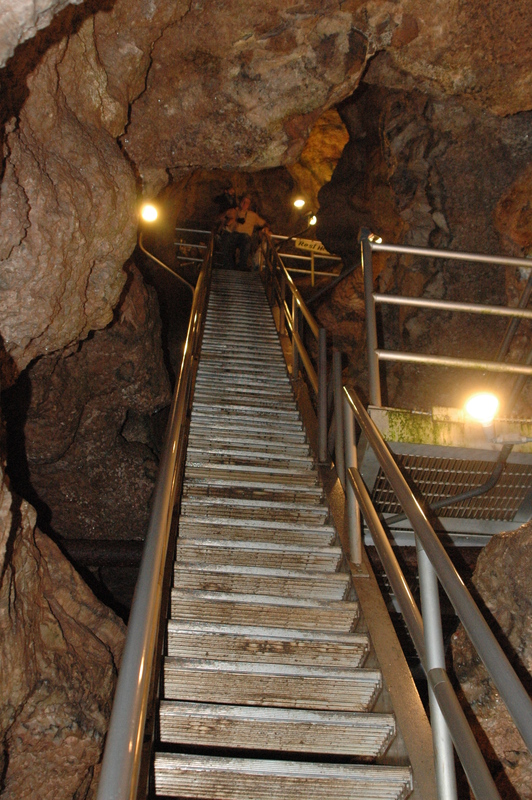 And it is even more challenging to climb back up these same steep stairs when exiting the cave after a short 45 minute tour. 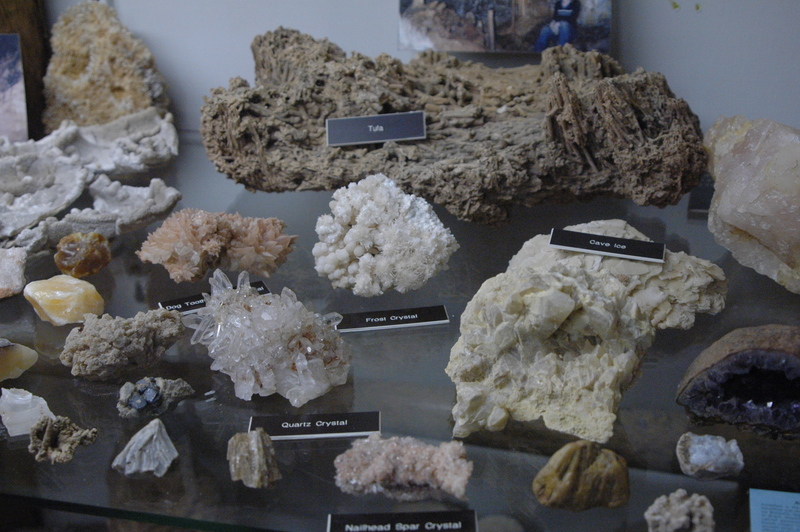 They do have a nice display of dog-spar crystals. 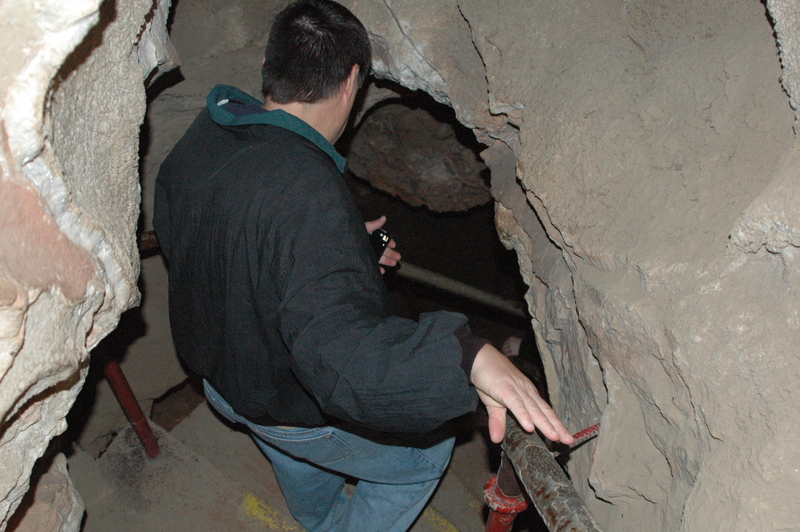 During the great flood of 1972 in Rapid City, this cave was flooded and the owners have not cleaned out the debris that remains. So there isn’t too much to see on this tour. Cost for adults is $12.00 (free with VIP pass). Our advice: save your money! We enjoy visiting caves, and are looking forward to visiting Mammoth Cave in Kentucky this fall. So stay tuned for our review on that!